Daughter Holcombe died on 27 June 1828. She was born on 27 June 1828. She was the daughter of Sylvester Holcombe and Betsy Hastings. [S116] Esther Griswold French and Robert Lewis French, Griswold, page 47. [S116] Esther Griswold French and Robert Lewis French, Griswold, page 48. Anna Street was born on 24 November 1710 at Groton, New London Co., CT. She married Peter Lester in August 1733. Anna Street died on 6 March 1790 at age 79. [S116] Esther Griswold French and Robert Lewis French, Griswold, pages 48, 84. Lucretia Holcombe was born on 15 May 1819. She was the daughter of William Holcombe and Julia Barnhart. Perkins E. and Sarah were enumerated in the 1850 Verona, Oneida Co., NY, federal census. He was a farmer age 37, she was 33. Children in the household were Charles 11, and Ellenetta 8. Perkins and Sarah Ann were enumerated in the 1860 Verona, Oneida Co., NY, federal census. He was a farmer, age 47, she was 44. The only child in the household was Charles P. 21. Perkins Elizur Hayes was born on 20 December 1811 at Granby, Hartford Co., CT.1 He was the son of Elizur Hayes and Sarah A. Pratt.1 Perkins Elizur Hayes married Susan Randell, daughter of Abram Randell and Rebecca Harrison, on 3 October 1837 at Oneida, NY.1 Perkins Elizur Hayes died on 12 May 1867 at Verona, Oneida Co., NY, at age 55. Elizabeth Pellet married Phineas Lester. 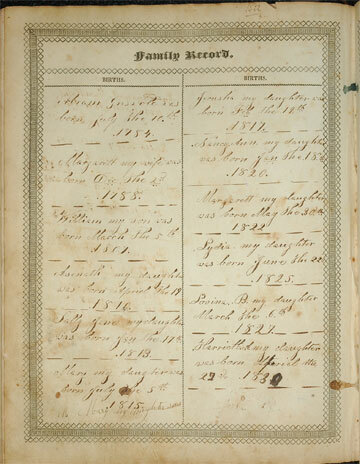 Anson and Helen were enumerated in the 1850 Waterloo, Jefferson Co., WI, federal census. He was a farmer, age 26, she was 24. The only child in the household was Sarah 1. "H. C." and Mary were enumerated in the 1860 Waterloo, Jefferson Co., WI, federal census. He was a farmer, age 47, she was 36. Children in the household were S. M. 11, "Enness" 5, and Jay 2. Daughter Holcombe was born on 24 January 1821. She was the daughter of William Holcombe and Julia Barnhart. Daughter Holcombe was born on 17 September 1827. She was the daughter of William Holcombe and Julia Barnhart. Daughter Holcombe was born on 18 April 1830. She was the daughter of William Holcombe and Julia Barnhart.